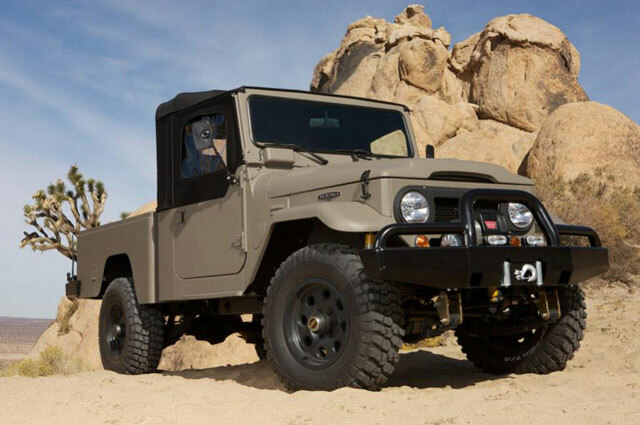 Believe it or not, the truck in the picture above is not an actual vintage Toyota Land Cruiser, but rather a meticulously hand crafted, new from the ground up, custom 4X4 with styling inspired by the immensely popular old school Land Cruiser. Even better, this is not a one off like a Foose creation, but is built by ICON in L.A. in small series production. The most impressive thing about the vehicle is it's mad attention to detail, nothing has been overlooked, even the knobs on the dash are made with a level of quality normally associated with a Rolls or Bentley (probably better). All this does not come cheap as you might have guessed, the 25 or so vehicles ICON cranks out per year go for $100K give or take. They are available with an International Turbo Diesel 4 cyl or a couple of different Chevy V8's. Check out their site, the ICON FJ really needs to be seen to be believed. Super cool- They are just launching a new one called The Dog, based on vintage flat fendered Willys yet bespoke and contemporary content and design. Brilliant! And an EV version is in the works too! Love it, something different than the misdirected efforts in Detroit. Probably did it without public funds too!